Claude Monet is a famous French impressionist painter. The main goal of these artists was such an image of the surrounding world, which would have caused positive emotions among those who would consider the picture. Monet, as a representative of the Impressionists, it could not be better. Here is a picture of “Topol”. At first glance, these are ordinary poplars, but how many unusual and unique things are in them! Poplars grew on the bank of the river, called Ept. It was here, near the artist lived and worked himself. 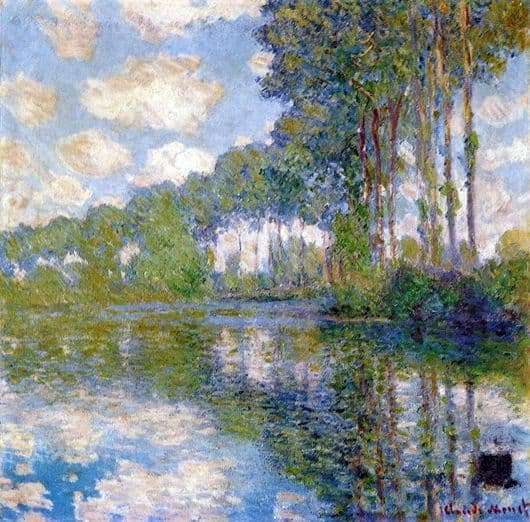 In 1891, Monet decided to start painting these wonderful poplars, because not only he, but the whole world should appreciate their beauty. Of course, when drawing this famous painting, Claude did not even imagine that she would get such great fame. The artist used the technique – a reflection of the poplars in the lake. Due to this, the picture seems even deeper. It seems that these poplars are endless, as if they are stretching into the distance, right up to the horizon. The sky is also reflected in the water. Due to this, the already blue lake becomes even more pure, transparent and bottomless. In the picture you can see three primary colors – blue, green and blue. Blue symbolizes purity, green – infinity, and white – the world. Trees resemble statues that have long stood peacefully next to each other. Monet chose the poplar as the subject of his drawing, because they made up most of his native nature. He painted, looking straight at them, trying to convey their true beauty. When the artist learned that they want to cut down, he immediately bought a plot with trees. And the reason for this was not only that he did not have time to complete his picture. The artist simply did not want these poplars to remain only in his drawing: they looked much more beautiful live.